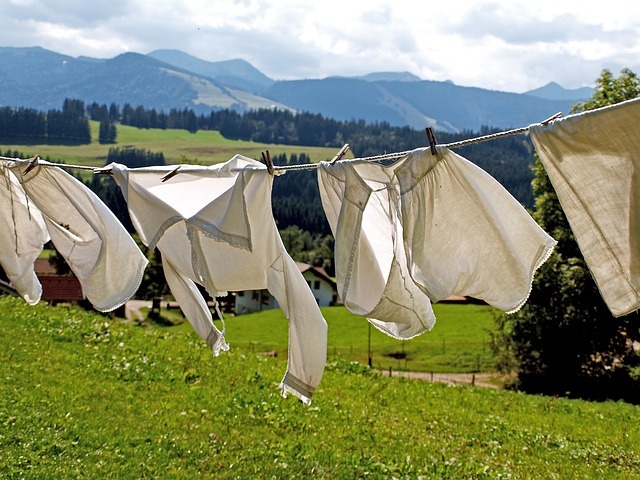 Ditch the fabric softeners and dryer sheets, and use these simple, non-toxic alternatives to naturally freshen your laundry without using harsh chemicals. If you’ve read my Liquid Laundry Soap or Powdered Laundry Soap posts, you may be wondering how I’ve tackled the issues of fabric softener and dryer sheets. Read on to find out why I don’t use these products and how I naturally freshen my laundry without the use of harsh chemicals. UPDATE: I’ve completely stopped using homemade laundry soaps – find out why! It’s easy to guess why I don’t like the liquid softeners – I hate the idea of artificial fragrances and residues left on my clothes, when it’s supposed to be in the washing machine to get washed! But what about the dryer sheets? What could possibly be wrong with dryer sheets? Well, besides the artificial fragrances (again), a quick online search returns a long list of some very concerning chemicals – Benzyl Acetate, Ethyl Acetate, Chloroform, A-Terpineol, among others that are neurotoxins, carcinogens, and even listed on the EPA’s Hazardous Waste List! For a complete list of what’s actually in your dryer sheets, along with their health risks, visit this link. Add about 1/2 cup baking soda to the wash basin while it’s filling with water and let it dissolve before adding the clothes. Instead of using a liquid fabric softener, use 1/4 -1/2 cup of white vinegar in the rinse cycle of your washer. If you have a fabric softener dispenser just add it there, and you’re good to go. If not, you can just use an old Downy ball or just manually pour it in during the rinse cycle. Take a small piece of cotton cloth (cut-up shirt, washcloth, etc. ), soak it with water and wring it out so that’s it’s just damp. Add about 5 drops of your favorite essential oil all over the cloth (orange, tea tree, and lavender work great! ), and throw it into the dryer with your clothes. This works best if its done in the last 10 minutes of drying. When you take out your clothes, they’ll have a nice, light scent from the essential oils. Just keep wetting the cloth and using it over and over again until the smell runs out. Then toss it in the wash and start all over again. These 3 simple methods are the easiest way to naturally freshen your laundry without the use of harmful chemicals. Want 2 more ways to remove toxic chemicals from your laundry room? How do you keep your laundry smelling and feeling fresh? Previous Post Best DIY Face Masks for Every Skin Type! 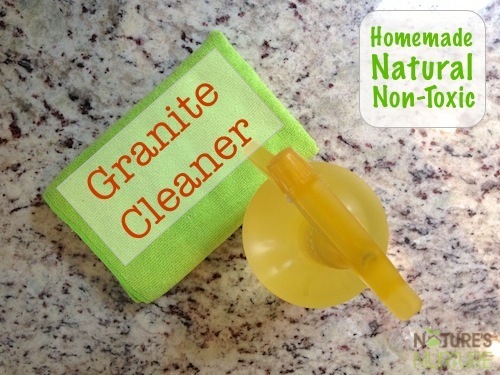 Next Post Homemade Floor Cleaner + All-Purpose Cleaner & Disinfectant!
. I noticed in your recipe for liquid washing detergent that you used borax in it. i was going to do one similar but after reading about borax, I found another recipe to try. I found this about borax while looking at different recipes. Borax use is somewhat controversial in green circles; it is a naturally occurring mineral, but it is also toxic. This was posted years ago, but maybe your site is still current. I suggested to my daughter to try adding vinegar as you suggested but she was concerned it might take the color out of some of her clothes. Has that ever happened to you? No, I haven’t noticed this happening at all. 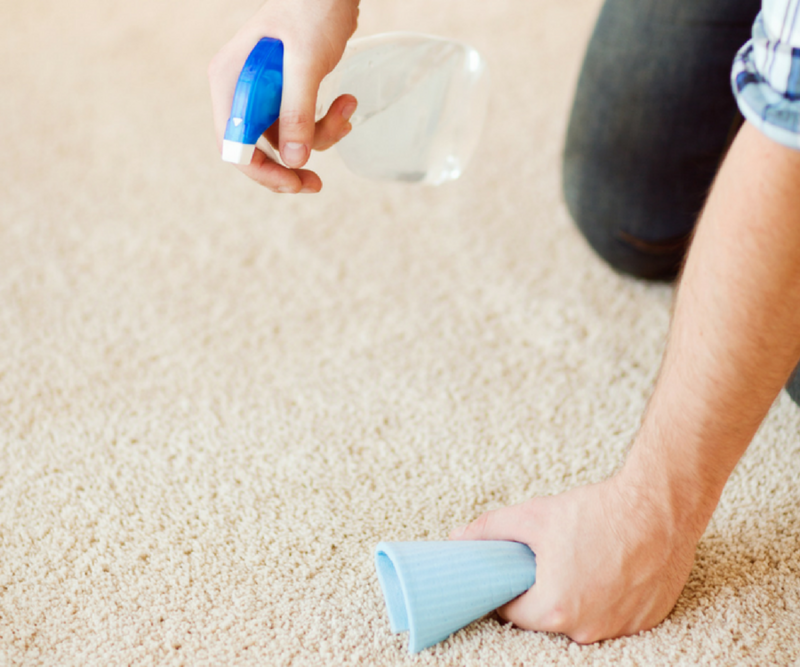 And actually, some places recommend adding vinegar if you want to prevent your colors from fading! Great question! I’m going to add a section to this post about it. Static is something I haven’t completely conquered, but I’m managing quite well with the use of wool dryer balls and a static spray from Static Schmatic. Of course the very best thing you can do for your clothes is to dry them outside on a clothesline, but I know that’s not a possibility for a lot of people. Yeah, same here about the scent not lasting for more than one load. But safety pins – that sounds great! I’ll have to try that. I wanted to chime in about the wonders of clothes lines. We moved into an older home that had a clothesline. Family and friends joked with us asking us if we were going to hang our clothes out to dry……hahaha….etc. Well I did start hanging our clothes out to dry and fell in love with how fresh our clothes smell!!!! Now I wish every home would have a clothesline, even newly built homes. If you have stinky sheets, pillows, bedding, setting them outside in the sun for a day will remove all smells. Try it……its free and better than throwing old items away and buying new! Also, a wash clothe with several safety pins attached will remove static when you do run the dryer. Oh, and great tip about the clothes pins in the dryer – I’ll have to try that! I wish I could have a clothes line again. Moved to a condo so can’t do that now. About safety pins…. I have been using safety pins to keep sock pairs together in the laundry for a long time… don’t have static problems too often so guess that is why ! Why cant the damp cloth with essential oils be dried with the wet clothes in the dryer? Why foes it need to be a second drying cycle with no heat? I think the long heat time just dissipates the scent before it has a chance to do anything to the clothes. At least that’s what I’ve found. But you could definitely try it and see what works for you! Great post. Thank you for sharing. I’ve got about an hour until I get to see my 1st batch of liquid laundry detergent congeal. The one thing that doesn’t make sense to me is the amount of EO you are suggesting to add to the mixture. I believe it says 1 oz. 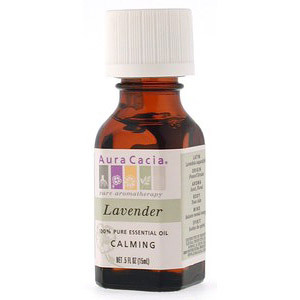 Since there are 29 milliliters in an ounce, that would mean I would be adding 2 whole bottles of my 15 ML Aura Cacia EO’s. Doesn’t seem right…am I missing something? Thank you for the article. 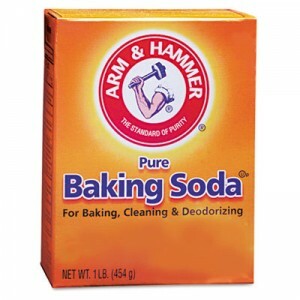 I will try using baking soda. I have been using homemade fabric softener in the washer (all natural hair conditioner mixed with vinegar and water) and adding a piece of cotton cloth with essential oil to the dryer but my husband’s work clothes still don’t smell fresh. We have a HE washer too and I have tried just about everything. I am also hoping that when the weather is warmer and I can line dry my clothes, it will help with the smell. However, I was hoping to get a few more ideas from this article 🙁 If I have any luck finding something new, I will post it! Thank you! Thank you for posting this information! Now I can remove the baby laundry soaps from my baby registry. With a family of 6 (5 until January) this is a true money-saver. My husband and I are live in care takers for my in-laws, all of whom are incontinent and or have regular ‘accidents’. I just took my first wobbly little steps toward a green household by making our own laundry detergent. Does vinegar and baking soda help with the stronger scents that I may be faced with? I hate to think of having stinky laundry after it’s washed… It can end up that way even with the commercial stuff. Have any tips or tricks that could help me? links? It seems everywhere I look tells me to try ‘green’ chemical cleansers, I would rather have a home remedy and avoid the cost, waste plastic, etc. Hmm, I really have no experience with stronger scents like you mention, but I would definitely recommend at least trying the baking soda and vinegar. Also, hanging the laundry out in the sun can do wonders! It’s great for stains and disinfecting too 🙂 And after they’ve dried, you can spruce them up with a quick tumble in the dryer using the homemade dryer “sheets” I’ve mentioned in this post. Good luck! Hi, for strong laundry smells, try ‘Norwex’ odour remover. You can add 1/2 to 2 cap full to your softener dispenser and that will certainly remove odours in your washing. We are recent converts to making our our cleaners and detergents, (we made our first batches of everything just over a month ago, and we’ll never go back!) and I’ve been adding cinnamon or peppermint EO with the vinegar for the rinse cycle. There is a very faint scent when I take the clothes out of the dryer, and I was happy to see your suggestion of using a piece of cotton cloth for a bit of a stronger scent. We’re making our first batch of liquid laundry detergent this weekend, (we made a powdered one last time) and I can’t wait to try that out in our next load of laundry! Hi! This blog definitely inspires me to not use store-bought laundry stuff anymore. My reason being more financial and second only to the environmental factors. We are a single income family and my kids are going to start private school this coming SY so I need all the money-pinching tips I can get. My only question, what kind of vinegar do you use? Distilled vinegar? I will try your floor cleaner as well 🙂 Thanks. Hi Ellen, thanks for stopping by! I’m so glad you’re gotten a little inspiration! I’m humbled 🙂 I just plain old white vinegar. Distilled works fine. Just as long as it’s not like a cider or wine vinegar, you should be fine. The floor cleaner is amazing! Works great for everything – more like an all-purpose cleaner 🙂 Hope you like it! Just wanted to add a tip. This is the time of the year to stock up on vinegar. Watch your grocery store sales papers. Here it is pickling season, so a couple of our stores will run the gallons of distilled vinegar buy one get one free. 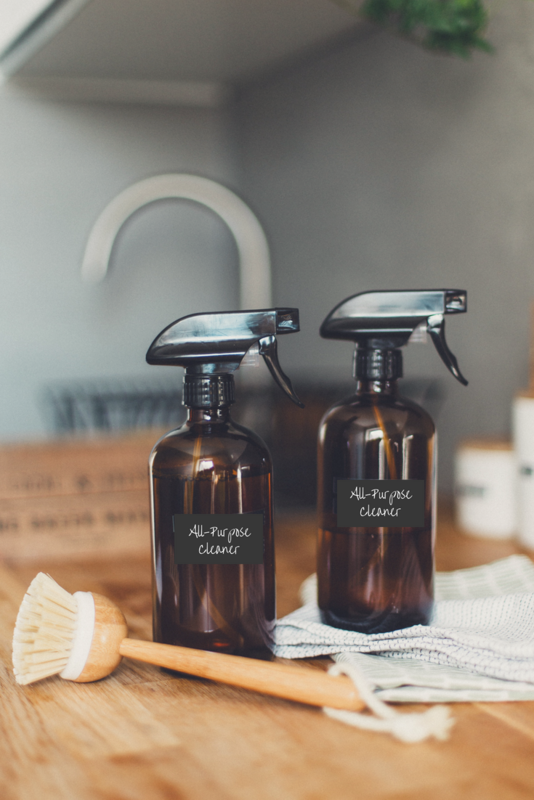 The jugs are also great to re-purpose into containers to store some of the cleaners that I like to make by the gallon – like window cleaner & foaming hand soap. How do you make foaming hand soap? I’ve never made liquid laundry soap or household cleaners either. Could you give the directions for these as well? I found your blog through your comment about this idea on Our Homemade Happiness. I can not wait to try this! My sheets & towels are the only thing that goes through the dryer & this would be the nice little oomph they need after their vinegar rinse. They really do come out smelling wonderfully. It’s a nice, light scent. Not at all as strong or overpowering like the commercial stuff! I also just found you through Pinterest and can’t wait to try some of these ideas. Just wondering – do you have any favorite essential oils or blends. I love the scent of Lavender on sheets, towels, etc. but I would like to have a “brighter” fragrance for my clothing. Any suggestions? Hi Debbye! Welcome, thanks for stopping by! Personally, I’m partial to lavender and use it for everything lol 😉 I just recently started using orange for cleaning products, but that’s as far as my creativity gets. Why no essential oils for the babies clothes? Also, I’m wondering why y’all don’t try the fragrance-free/dye-free detergents, softener, and dryer sheets? Pretty much every brand now has them, even the generic from the stores. As for your other question, there’s a few reasons why we don’t just buy the commercially available products. Even if they’re fragrance/dye free, we still don’t know what other chemicals are in them, and we don’t want that on our clothes, our skin, and more importantly, running off into the water supply. Secondly, let’s face it, laundry products are expensive, and even more so when you go with the natural brands; so making your own makes more sense financially too. We’re all about being frugal here 🙂 And lastly, and I think most importantly, is the concept of sustainability. How long are we willing to continue buying these same single-use products, at their high prices? If we can make homemade versions of them, that helps us out in the long run both financially, and so that we’re not constantly dependent on commercial products. Does that make any sense or was I just rambling? Lol 😉 Hope that helps! Hi Sarah! Thanks for the tips- I wasn’t searching for ideas on going green but ideas for alternatives to traditional laundry chemicals. When you’re a college kid, paying $11+ for laundry detergent seems crazy. I figured the chemical-y smell was something I would just have to deal with. Sounds like I’ll have to deal with it no more! One question though- is this as effective with stains as the commercial laundry detergents? Hey, I found your site via Pinterest. I’ve been using vinegar as a fabric softener for several years with great results. I have a front loader and often drop a few drops of EOs right into the vinegar for a very slight scent. I mostly use it on towels and sheets. We don’t miss the smell of fabric softener and when we wash our clothes at other’s home and use commerical products, they smell too strong to us! Ooh, thanks for the tip on putting the EOs right in with the vinegar! I never thought to do that! I guess I thought the scent would wash away with the vinegar, but I guess not? I’m definitely going to try it next time I want to freshen up a load of laundry 🙂 And I know what you mean about not missing the smell. I can’t even stand to smell that laundry smell wafting through my neighborhood when others are washing! or the laundry aisle at the supermarket? Forget it! …it’s funny, because I used to LOVE all these scents before I became more green, and now I cringe at them LOL. Once you untrain your nose, it becomes so sensitive to those chemicals. I just use a tennis ball in my dryer. I cannot tell a difference between this and when I used to use actual fabric softener. I also just recently came across another idea on Pinterest: throw in a couple balls of aluminum foil to get rid of static cling! Excellent idea – going to use the aluminum foil balls – my daughter has excema and can not tolerate most fragrances, so dryer sheets are not an option. Aren’t tennis balls toxic? The problem with aluminum foil is that aluminum is linked to both alzheimers and breast cancer. Better to not use the foil. That is why it is so important to check your deodorant also. Many have aluminum in them. True, Julie. Which is why I stopped using conventional deodorants years ago and make my own (even the natural ones from health store never worked for me). But you’re right, as much as we avoid using aluminum bec of links to alzheimer’s, I feel silly for not applying it here as well. Thanks! I just made felted wool yarn balls for the dryer and you can scent them too. NO cemicals as I get the yarn right from the farm. 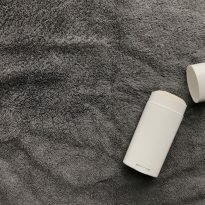 They also (unscented) leave no smell or residue behind. And if you have little ones in diapers they do not deposit anything to inhibit absorbsion. Love your blog! 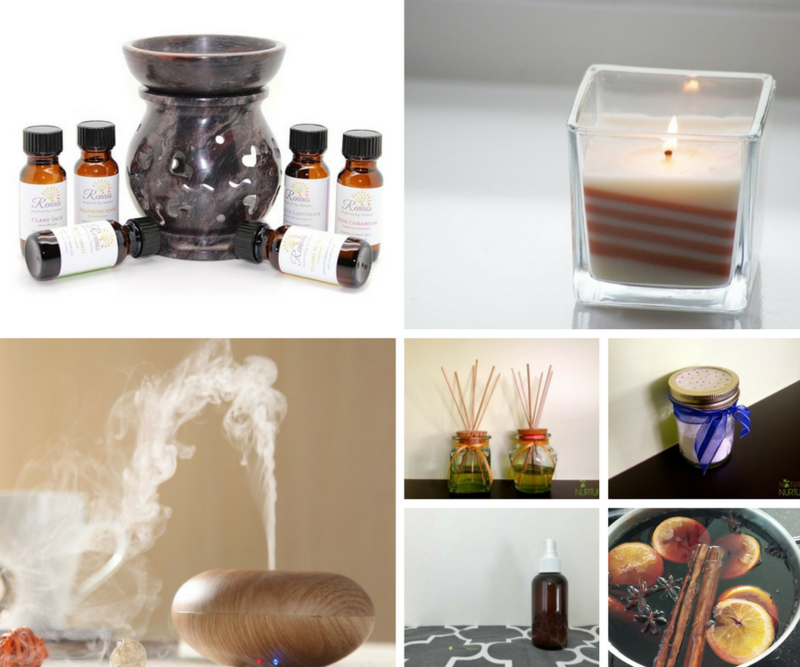 Just a quick qs – where do you get your essential oils from? Wa’alailum Assalam sis! Thanks 🙂 I get my oils from my nearest natural/health foods store. When I lived in the States, it was usually Whole Foods or something similar. There are also many online retailers that sell them too if you can’t find a store nearby. I love doTERRA oils! They are the highest quality, purest essential oils on the market. No pesticides, herbicides, or any of that nonsense that some of the other companies allow in their oils! Definitely don’t want that on my skin! And they have an indefinite shelf life because they don’t contain any contaminants. Reply to this post if you have questions to see for yourself how awesome they are. =) I use them in all my house cleaning, not to mention their incredible medicinal/ therapeutic qualities.